For the first time, Cunard’s ‘three Queens’ fleet gathered together in spectacular fashion in Liverpool, its spiritual home, as the company marked its 175th anniversary. The event culminated with the three magnificent ocean liners, the largest passenger ships ever to muster together on the River Mersey, lined up across the river just 130 metres apart as the Red Arrows performed a fly-past overhead to the delight of the hundreds of thousands of spectators. Cunard’s flagship Queen Mary 2 sailed from the Liverpool berth up to the mouth of the Mersey at 10.45am on May 25 (local time) to meet her sisters, Queen Elizabeth and Queen Victoria. The three ships then sailed in close single file down the river to Liverpool's Pier Head with its iconic Three Graces: The Royal Liver Building, The Cunard Building and The Port of Liverpool Building. Queen Mary 2 slowed in the river opposite the Cunard Building – Cunard’s headquarters for nearly 50 years until 1967 – with her sister ships stopping ahead of her to create a three ship line-up, watched by spectators of both sides of the river. Spaced just 400 metres apart, the three ships then performed a graceful 180 degree synchronised turn to starboard. At the mid-point of the turn, all three ships lay across the river, creating the spectacle of the fleet’s three bows dramatically set against the backdrop of Liverpool’s famous Three Graces. Queen Mary 2 then sounded ‘175’ on her ship’s whistle – first one, then seven short blasts, then five more. With the full turn completed and the 150,000-tonne Queen Mary 2 now in the leading position, her two 90,000-tonne sister ships then glided towards either side of her to create an arrowhead formation, with the flagship just ahead of her two consort ships. 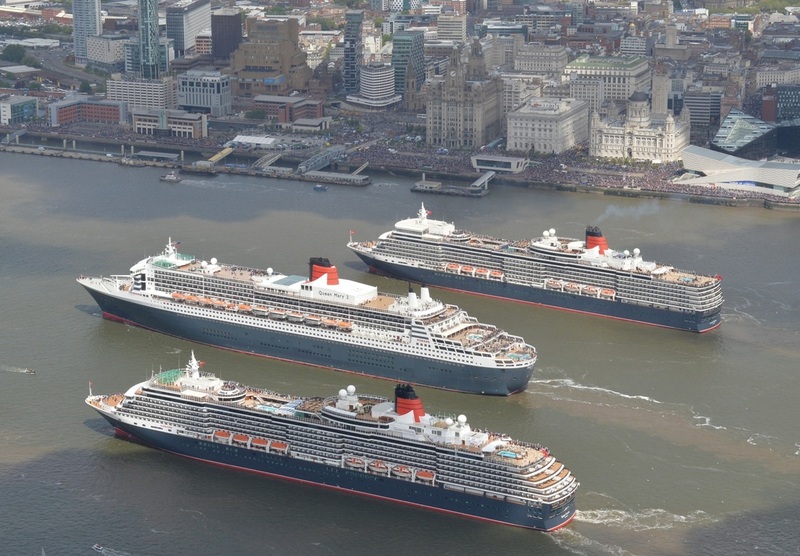 Finally, the entire fleet lined up three abreast across the river just 130 metres apart, as a salute to the Cunard Building and the City of Liverpool. With the three Queens in this tight formation, the Red Arrows flew in formation low over the river, a coup de grace which created a thrilling, once-in-a-lifetime moment for the spectators on shore. Commodore of the Cunard fleet Christopher Rynd said it had been a privilege to bring the Cunard fleet together on the Mersey for the first time ever to mark Cunard’s 175th anniversary year, as well as the company’s historic and ongoing partnership with Liverpool. “After months of planning, today the three ships have manoeuvred on the River Mersey as never before, right in front of the Cunard Building, one of Liverpool’s Three Graces and a world heritage site as well as Cunard’s former headquarters,” Commodore Rynd said. “The Red Arrows flypast at the climax of the ships manoeuvres added a finishing touch to an extraordinary day. Cunard Director of Marketing Angus Struthers said Cunard was touched by the fantastic reception the three Queens have received from the people of Liverpool and beyond on this 175 Anniversary day. “It feels like 175 years of stories, people and history linking Cunard to the city have really come alive. With the Red Arrows flypast adding an amazing extra ‘wow’, it’s been the sort of day we hope parents and grandparents will remember with their children and grandchildren in years to come,” Mr Struthers said. “It's taken a huge amount of planning and cooperation between Cunard’s ships, the Mersey pilots and Liverpool's cruise operation to make this happen and today is testament to the great results that continue to come out of Cunard's partnership with the city.